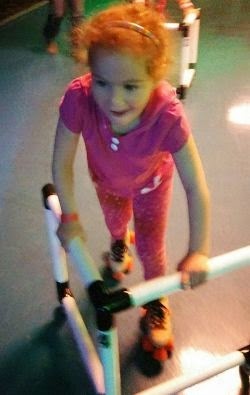 I recently took my five-year-old daughter rollerskating as part of a fundraiser for her elementary school. Despite my doubts about her skating prowess, she adamantly told me she wanted to lace up. She did, and proceed to fall while walking, standing, and falling. She fell more times than one of the Real Housewives' faces before their next surgery. Thanks! I'll be here all week. And yet she kept going, even when she fell on her tiny tuchas. She even rented one of those skater helpers which holds her up while she skates. Though she continued to lose her balance along the way, she made her necessary turns to perfect her style.She tried. Boy, did she try. And I'm nothing but utterly proud of her. We can all learn something from our children when it comes to accomplishments. Despite their failures, they continue to try and get it right, even if their rear ends are black and blue. Writers can definitely be educated by our children, because we're probably the group which repeats "No, I can't do it." over and over again. We get caught on a chapter, we give up and watch Netflix. We don't get accepted by an agent or a magazine, we delete the story or manuscript from our hard drives and decide to work in fast food. Our editors come back with extensive changes, we call them dirty names behind their backs and give up. This the wrong way to do things, ladies and gentleman. Yes, we writers and authors are a proud bunch, but we just can't give up because something doesn't work for us. We need to be like the little roller skaters in the world. We need to get up, rub our tushies, and try again. If it means going a different route in our story, deciding to self-publish our work, or discussing the changes with the editor, so be it. My daughter will continue to practice her roller skating until she gets it somewhat right. I hope you keep trying on whatever you're writing until you breathe that sigh of relief that it's done. And then, pick up your skates and head to the rink. Are you a trier or someone who gives up easily? I admire your daughter's ability to stick with it in spite of the falls. Writers need to be like that, and it's not easy.